Today we walked around Tel Aviv and went to the Art Museum here and also the stores, grocery, and cafes. What I really liked was seeing it up close and not from the back of a tour bus. After just a day or so, I started to feel like I was really experiencing life here. Crossing Menachem Begin Road, we ran into these fashion-conscious ladies. 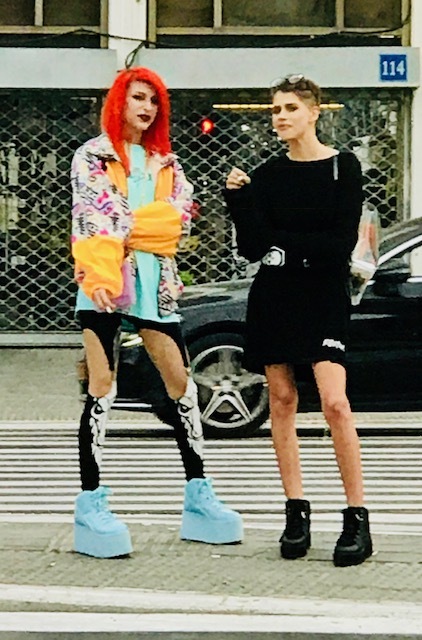 The colorful clothes and hair, the tall blue shoes, the ripped leggings of the women on the left definitely stood out. Juxtaposed is the lady on the right in the black dress, short haircut, bag, and glasses. This pair was a standout! In a way, I miss the Holy lifestyle of Jerusalem here in Tel Aviv, but at the same time, I like the cosmopolitan and modern life here too. Anyway, I feel like I am learning a lot and enjoying experiencing culture and religion Israel-style.